Rats and mice are known for being problems for SC property owners, but did you know that armadillos can cause all kinds of problems as well? While these mammals aren’t likely to get into your home or business, they can damage your lawn and garden. They can even put your health at risk. Learn more about these animals in case you end up needing South Carolina armadillo control. Armadillos have a distinctive appearance thanks to their body armor and snout. These animals, which are related to anteaters, have thick, strong rings around their body and tail and a long, thin snout. In SC, the nine-banded armadillo is the species that is most often found. This species has nine rings of armor around their body, as well as 12 rings around their tail. When they’re fully grown, they can weigh up to 17 pounds. Armadillos are more common in Texas, the Midwest and the deep South, but they have been moving northward into SC. Armadillos are nocturnal critters that are out from evening through early morning, especially during the summer months. You’re unlikely to see them around when temperatures are extremely high or low. Armadillos tend to stay in areas that provide them with shade and shelter, such as woodlands and brush, as well as areas near water. They feed on a diet of mainly insects, although they also eat vegetables, fruits, frogs, worms, snakes and other smaller animals and invertebrates. They dig long burrows, where they care for their young and stay safe from predators. Armadillos can do a lot of damage to gardens and lawns as they dig burrows and root around for food. While they might not eat your plants or crops, they can disturb them as they look for insects and other sources of food to eat. 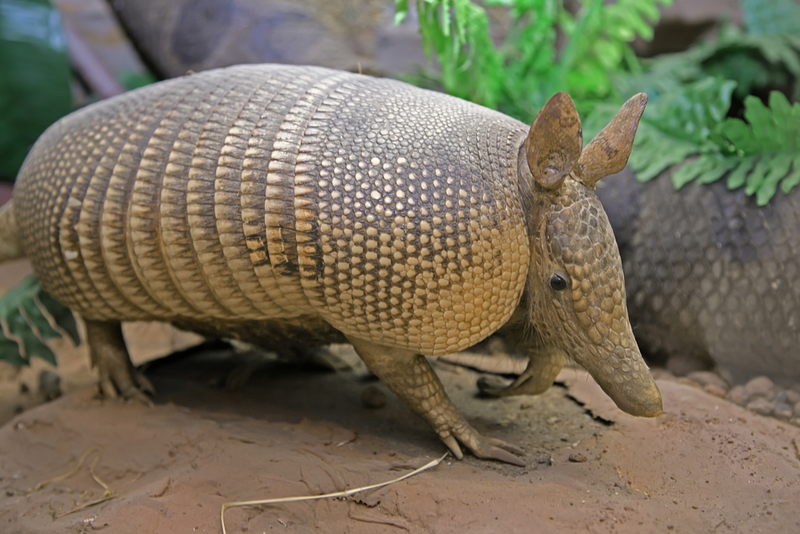 When you have an armadillo problem on your property, you’ll need South Carolina armadillo control to prevent damage. Keep in mind that armadillos can also dig their burrows closer to your home, such as under your foundation or driveway, as well as under pools. This can cause damage to these structures unless they’re removed. Armadillos don’t just cause property damage. They can also be a serious health risk to humans. These animals carry bacteria that cause leprosy and parasites that cause Chagas disease. For this reason, you should make sure that you aren’t exposed to any blood or other fluids from these animals, and you should never touch them with bare hands. When you have an armadillo problem, it’s best to let South Carolina armadillo control experts handle it. At Island Pest Control, we have the right equipment to catch these animals safely and remove them from your property before they can cause any major problems. Having our technicians deal with your armadillo problem also lowers your risk of coming into contact with these animals. You can take steps to discourage armadillos from digging burrows on your property or rooting around your yard for food. Since they prefer areas that offer plenty of cover for digging their burrows, remove any brush on your property. You can also put up fences or other barriers to keep them out of your yard or garden. Just make sure that these barriers are buried up to 18 inches in the ground, so that they can’t dig their way under them. Any barriers you put up should also be several feet high to effectively keep them from being able to get into your yard or garden. If you need help for armadillos on your property, please contact Island Pest Control. Our team offers safe South Carolina armadillo control to prevent these animals from damaging your property and causing health risks.